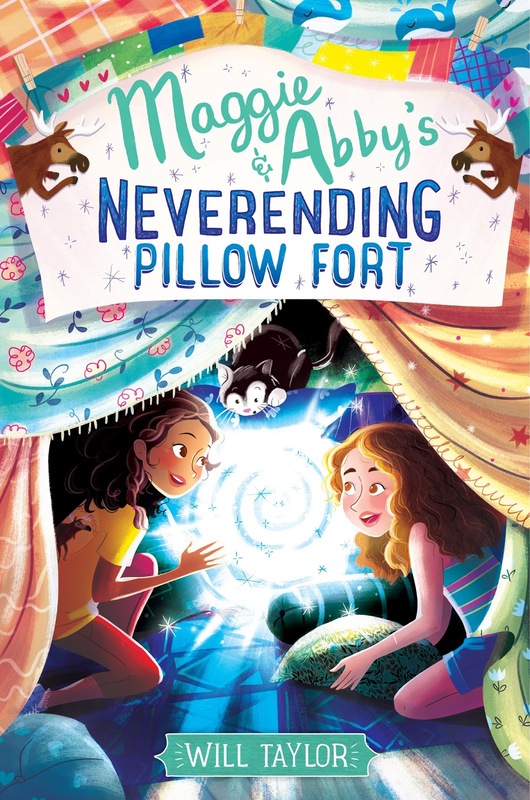 I'm absolutely thrilled to share the official cover of Will Taylor's upcoming middle grade novel, Maggie and Abby's Neverending Pillow Fort, at The Hiding Spot today. I've long been a fan of Will's wit and charm via social media, so the idea of finally jumping into this novel of magical pillow forts is incredibly exciting. The countdown to the novel's release on April 3rd, 2018 is on! Turns out their little pillow fort network isn’t the first to exist. It’s not even the second, or third, or hundredth. A massive network of linked-up pillow and sofa forts already spans the globe, and the kids who run it are not happy with Maggie and Abby. And they are not fooling around. With just three days to pass the North American Founding and Allied Forts Alliance’s outrageous entrance tests or lose the links forever, Maggie and Abby pull out all the stops to try to save their network. But the kids on NAFAFA’s Council have their own agenda, and it just so happens Maggie’s fort might actually hold the key to a mystery that’s gone unanswered for generations. There’s only a little bit of summer left to burn, and Maggie and Abby are determined to win back their pillow fort freedom. But can their mission—and their scrappy homemade network—survive the mission? What was the cover design process like? Were you very involved in the process? [My editor] Elizabeth's first email about cover ideas reached me in a chilly dorm-turned-hotel room in the tiny town of Bifrost, Iceland. I was there on a bucket-list trip with my dear best friend Alex Kahler, and I'm pretty sure I danced around the room for a good ten minutes at the very idea of my own cover. In my cut-off dinosaur tee shirt and gym shorts, because laundry day. Once I calmed down I sent back a rambly email of hopes and wishes, along with some comp images. I mostly chose "Magic Schoolbus" covers, because they are awesome and always show Ms. Frizzle and the kids in action, already lost in the adventure, which is where I love to be. After that it was just a long, quiet wait, until I snuck a peek at my phone during work one day and there it was: the cover of my wildest, most there's-no-harm-in-wishing-but-don't-get-your-hopes-up dreams. There was dancing then, too, but it had to be more subdued because there were also customers. Plus I wasn't wearing my dinosaur shirt. What's your favorite part of the cover treatment? 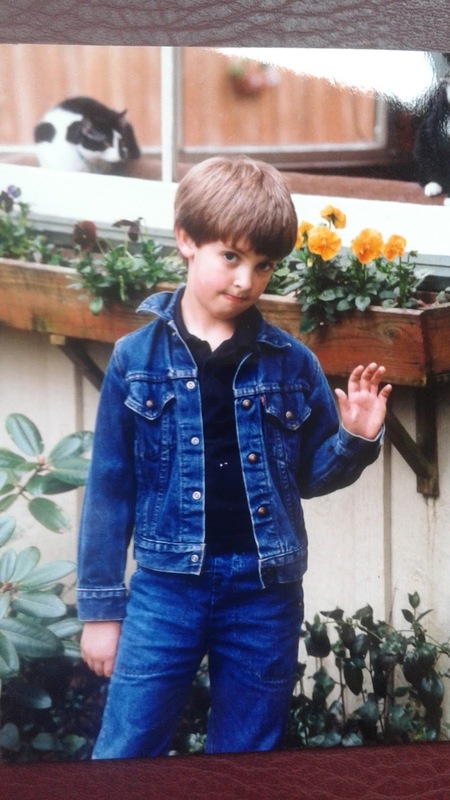 Will claims he now wears less denim. AM I ALLOWED TO SAY EVERYTHING? I AM SAYING EVERYTHING. I cried when I saw it, and I cried the next morning when I woke up and it was the background on my phone as I turned off my alarm. Having someone who you've never met create an image to represent your book is an alarmingly intimate experience, and [the artist] Monique did such a brilliant job I honestly still can't believe it. There are at least three inside jokes from the book buried in there, and Samson the cat looks so much like Jacob the cat (see author photo), who he was based on, that I'm still not entirely convinced Monique hasn't been going through my photo albums. I love the colors, the framing, the characters, the font...I love everything about it. Everything. What qualities will the ideal reader of your book have? Oh! Oh, I know this one! The answer is a sincere, actual, not-even-slightly-kidding belief that it's a true story. That linked-up pillow forts, and NAFAFA and ghost mooses and all the rest of it, are real. REALLY real. Really. When I was nine I bought a little old-fashioned key at a flea market for fifty cents, and I've carried it every day since. It smiled up at me from that tray of dingy, forgotten keys, and I've carried it around in the firm belief that someday, somewhere, I'll find a locked cupboard, a strange knot in an oak tree, or a gap in an otherwise normal brick wall that will be waiting for it. And I refuse to be unprepared when that day comes. There is so much room for magic in the world, and I think middle grade is the best genre to bring that possibility to life. And I hope people who read this book will build pillow forts of their own and crawl inside and stare at a pillow and believe, even if just for a moment, that it leads to another pillow fort somewhere else and they can go there. And get into all sorts of trouble. And now for the much-anticipated cover reveal of Maggie and Abby's Neverending Pillow Fort! How much do you love this cover!? Share your thoughts in the comments and be sure to add Maggie and Abby's Neverending Pillow Fort to your Goodreads and upcoming reads list! Make sure you whisper, I'm hiding! Bookseller specializing in kidlit, MG, & YA. Freelance reviewer. In my spare time, I blog here at The Hiding Spot, reviewing books, interviewing authors, giving away must-reads, and chatting & connecting with other bookish people!